Are you thinking about getting an auto loan to buy a car? Every day, tens of potential car buyers struggle with Common Fears When Dealing With Auto Loan Lenders. The biggest concern is whether auto loans are safe. This fear brings about confusion and bad assumptions about ordinary and subprime auto loans. Get over your Car buying anxiety today! This is common among college students or fresh graduates who are in their first jobs. Banks and car dealerships require potential car buyers to have a certain credit score. In addition, the car buyer should have a long credit history to convince creditors that he or she pays debts on time. All these requirements intimidate first-time car buyers seeking auto loan lenders. There’s also a monthly income requirement which seems to scare off potential car buyers fast. Auto loan lenders require a minimum amount of disposable income to prove that you’re able to pay up your installments on time. However, they set this amount so high that some car buyers believe that auto loans are strictly for the rich. You’ve heard and read several stories of how unsuspecting car buyers got tricked into getting auto loans for cosmetically enhanced jalopies. It’s really terrible because the victim ends up paying high interest for a car that has a really low market value. Apart from servicing an unfavorable auto loan, you also have to pay insurance and take the junk for frequent repairs. Potential auto loan applicants also fear getting tricked into signing an expensive auto loan plan. In fact, some car buyers feel tensed and confused when a car sales reps approach them. However, this fear arises due to ignorance on interest rates and personal credit score. Have you ever heard of the saying, The customer is king? Unfortunately, some customers walk into car dealerships with a cowardice-mentality. They approach the sales reps fearfully because they wrongly believe that negotiating for better prices creates a bad impression. However, this fear actually puts one at a disadvantage because car sales reps will take advantage of a fearful car buyer. One reason why some car buyers fear negotiating prices is due to ignorance on the car’s true market value. It’s hard to bargain confidently when you don’t have your facts right. Smart car buyers always use a car loan calculator before applying for an auto loan. A prudent car buyer actively negotiates for a better car price because he or she knows that a lower selling price leads to more affordable auto loan monthly installments. Some people feel intimidated at the sight of high car prices. A potential car buyer assumes that he can get a brand new Honda 2018 for $15,000. However, when he gets ready to apply for an auto loan, he realizes that a brand new Honda 2018 costs $25,000. This buyer feels crushed because he feels uneasy spending more than $15,000 on a brand new car. When a car salesman approaches this buyer for an auto loan, fear sets in. The intimidated potential buyer is too terrified to even think of how to save up for a cash deposit. In his mind, he’s already concluded that the auto loan installments will be beyond his financial reach. This fear resembles the fear of expensive cars. Potential car buyers who are self-employed may feel a little anxious about future payments. Why? Because there’s no guarantee that your current clients will renew their contracts after your deals. 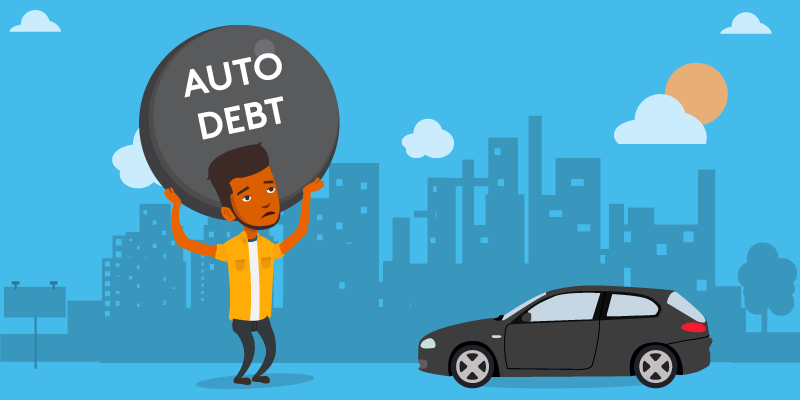 Car buyers with part-time jobs also feel worried about sustaining monthly auto loan installments because they are at the mercies of their employers. They actually depend on contract renewals while seeking permanent employment elsewhere. It’s your responsibility to get a comprehensive auto insurance cover after buying a car using an auto loan. In addition, you also have to take your car for frequent servicing as long as you have an outstanding auto loan balance. Plus, you need money every day to fuel your car. This financial commitment intimidates potential auto loan applicants. Why? Because the high recurring car expenses can push them into major debts. However, this fear is an unnecessary burden because you can lower your auto loan installments by requesting for a longer repayment period. The words subprime auto loan instills fear in most debtors with below average credit scores. Some consider them unsafe because mainstream credit lending institutions such as banks usually reject auto loan applicants with credit scores ranging from 550-620. The expensive interest rates associated with subprime auto loans enforces one’s fear of falling behind on auto loan installments. Car dealerships allow you to get an auto loan by trading in your current car and topping it up with a cash deposit. This option enables car buyers to spend less time and money saving up for a cash deposit. However, some car dealerships trick potential auto loan applicants into receiving really low offers for trade-ins. Car buyers who fear to bargain for better prices also dread car-trade ins because it involves plenty of negotiation. Perhaps the root cause of these 8 Common Fears When Dealing With Auto Loan Lenders is insufficient information on how auto loans work. Insufficient information leads to wrong assumptions that develop into misplaced fears. Are you struggling with these Common Fears When Dealing With Auto Loan Lenders? Complete Auto Loans will answer all your questions thanks to our highly experienced team of professional financial advisers and auto loan experts.